At 22 years of age, Danick Martel’s professional hockey career is just beginning. The diminutive forward wrapped up his second season with the Lehigh Valley Phantoms in May where he netted 20 goals and 20 assists in 68 games. While he is eyeing a leap to the NHL in the near future, Martel recently reached another milestone in his hockey career—on the floor. About an hour train ride from Prague sits Pardubice, Czech Republic. This small city, with its cobblestone streets, gingerbread cookies and chateaus filled with wild peacocks, recently served as the backdrop for one of the largest hockey tournaments in the world. But while Ales Hemsky and Dominik Hasek used to dominate the ice at Tipsport Arena, the ice was nowhere to be found this June. 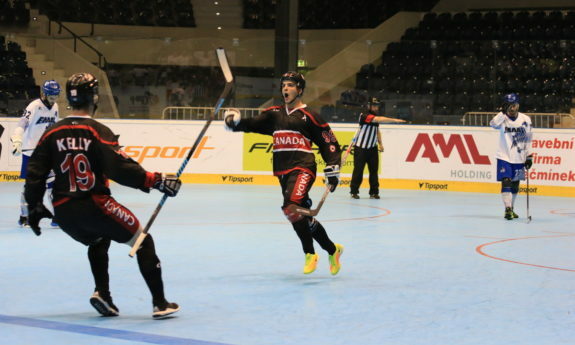 For the first 10 days of the month, Pardubice was the epicenter of the ball hockey world as 18 countries and 24 teams converged for the 12th Annual International Ball and Street Hockey Federation’s World Ball Hockey Championships. 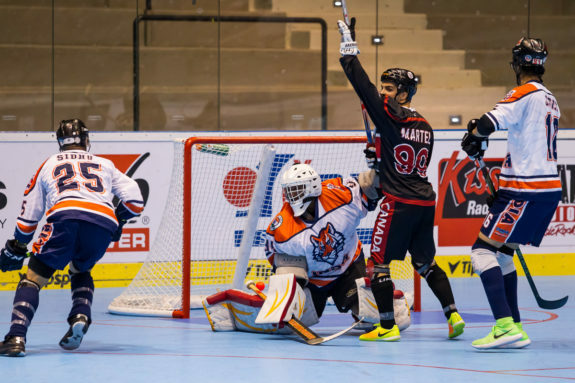 For Martel, who began playing ball hockey as a six-year-old growing up in Drummondville, Quebec, the 2017 tournament marked his first opportunity to represent Team Canada on the international ball hockey stage. And he did not disappoint. In seven games Martel notched seven goals and five assists as Team Canada marched to the gold medal game where they lost to Team Slovakia, who won for the third consecutive year. Along with his silver medal, the 2014-15 QMJHL First All-Star Team member was named the tournament’s top scorer and best forward. But for Martel, just being able to compete for his country, and to be a part of the team was something he’s always wanted, especially considering he only started playing 5-on-5 ball hockey two years ago. Making the jump from ice hockey to ball hockey can have its setbacks. In addition to shifting from the rubber puck that glides across the ice to the bouncy orange ball, there are also the vast amounts of sprints one does in each game. So, it’s understandable that just a month removed from playing in the American Hockey League playoffs with the Phantoms, Martel started the World Championships off a little slow. He only had two assists in Team Canada’s first two pool “A” games before netting a hat trick in an 8-0 win over India. Once he found his game, Martel dazzled the thousand of fans that attended the tournament. Utilizing his speed, he was a flash of bright yellow on the floor—thanks to his sneakers—as he continually found his way to the back of the net. Despite being one of the smaller guys on the floor, Martel was never afraid to crash the net. Playing in the AHL, Martel can feel the pressure. Signed to a three-year entry-level contract in 2015, he’s hoping to break into the Philadelphia Flyers roster this year. But at the 2017 ISBHF World Ball Hockey Championships, he’s fully aware that the gold medal was the ultimate prize. While his team came up short, Martel is looking forward to coming back in two years – and a chance at redemption. Following his performance in the Czech Republic, it looks like he may just have the opportunity.